When you’re feeling gloomy, look to others to help you see the silver lining in those clouds. Eyeore knows that he can count on friends to pull him up out of the doldrums. He doesn’t wallow there by himself for too long before turning to friends for the uplifting he needs. You are what you eat. – Eyeore likes to eat thistles, which may very well explain his thorny outlook on life. If only he’d share in some of Pooh’s honey, he might actually be able to develop a sweeter disposition. When you feel like you’re falling apart, it’s good to have a helping hand. – Poor Eyeore is forever losing his tail. It’s a good thing he’s got friends who are always willing to pin the tail back on that old donkey. A negative attitude makes everything seem worse than it is. – If you start off believing that your day won’t go well, it usually doesn’t. It’s easier to handle difficulties when you keep a positive attitude, and believe you can work it out. A negative outlook brings negative results. – Eeyore believes that bad things happen because that’s the nature of the world. He doesn’t realize that it’s his low expectations and poor self-esteem that really cause him his troubles. How you choose to view life is up to you. – Eeyore’s life and his home in Hundred Acre Wood are really no different than Tigger’s, yet their outlooks are polar opposites. Tigger really doesn’t have anything that Eeyore hasn’t got, except for a good attitude; and that makes all the difference in what each of them gets out of life. Misery loves company. – People who are unhappy tend to feel better when they surround themselves with others who share their downcast view of the world. It’s difficult to change your fortunes if you only believe the worst will happen, and you hang around others who think the same way. There is value in evaluation. 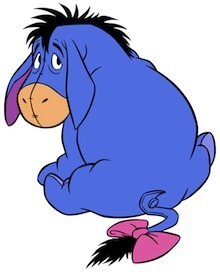 – Eeyore may be a downer, but he does provide a valuable asset to the Hundred Acre Wood crew. That is, he looks at things from every angle before he acts, anticipating every possible thing that can go wrong. This offsets the sometimes reckless actions of others like Tigger and Rabbit. All work and no play, makes Eeyore a dull donkey. – For all his deep thought and solid reasoning, Eeyore dwells so much on order, logic, and avoiding risk that he never takes time to enjoy life. There will always be risk in life, and we can never eliminate all of it. – It’s wise to plan, and to consider all possibilities, but it can’t take the place of action. We have to take risks in life in order to succeed, and even the best of plans can’t eliminate the possibility of failure. We will fail at times, it’s inevitable. What’s more important is how we handle failure.